Oh man, I don’t know about you, but this is probably the most enticing palette I’ve ever had to work with. I got them all today at the Pine Street Papery in Sausalito, which is actually on Caledonia Street. I got about eight sets of each of these for $70 total. Not a bad investment if you consider how many mandalas they will create. 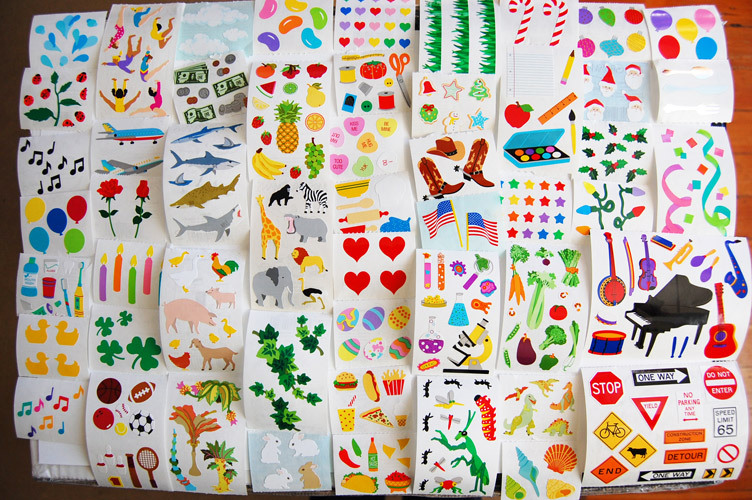 The Mrs. Grossman’s site says I can only make fifty art pieces with their stickers. Not that I intend to make more that, but it seems kind of bogus to market a product primarily as an art material and then limit the number of pieces your customers can make it. I can’t think of any other example of this. Hopefully the Bay Bridge will be open again by Monday, so I can go to the East Bay and pick up my little wooden bases. Then I can really get down to business. In the meantime I’ll work on making my own stickers so I have everything ready to go. The anticipation is killing me!